Senyorita Lakwachera: Alegre Guitar Factory,Our Cebu First Stop. Alegre Guitar Factory,Our Cebu First Stop. 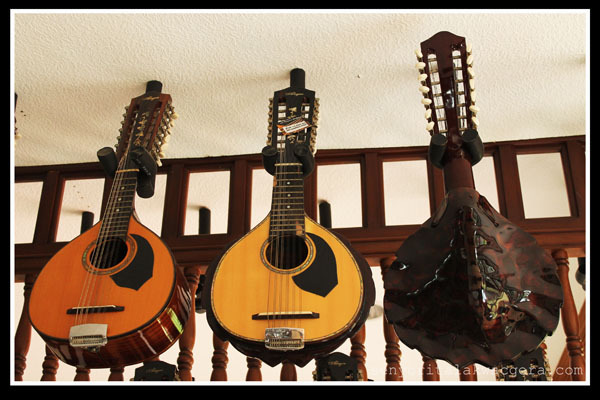 Cebu City Guitars are remarkable to each and every tourist visiting the city and we as a first time tourist wouldn't want to miss this chance of being able to see it personally. Alegre Guitar factory is owned and managed by Fernando M. Alegre, Their shop is one of the famous guitar shop in Cebu, and it is located in Mactan Island, Lapu-lapu City which is 15-25 minutes away from the airport via a cab depending on the traffic. When we entered the factory the first thing that we saw was the men crafting the guitars, I took a few minutes to watch how the guitars are being made in their shop and I can see how they delicately crafted each of them. We later entered to their show room and the person who guided us has been very accommodating. The first thing that I look into was the price; I’ve heard that the prices of their guitars vary depending on the buyer and were so bad for the foreign tourists. In that moment they have the tag prices on the items so only thing you should know is how to convert peso to your own currency. It was so kind for the person who guided us inside the showroom to explain the price – I mean why some are so expensive. The guitars are not just meticulously crafted they are durable; those that are expensive were made from hard woods like Nara. They have some tempting products, but we don’t have that budget to take one for now. But given a chance we would definitely consider going back to grab one. If I will weigh the price versus the quality, I could say it’s fair enough. Our first stop in Cebu, the Alegre Guitar Factory. We opted to go first here as it is the nearest destination that we have from the airport. Our route is going to Cebu City with only having one destination in Mactan which is Alegre Guitar Factory that’s why the route works for us. The Factory was quite far and as an observation there is a very few cabs going in that area, as a part of a contingency plan what I did was I asked the Taxi cab driver to wait for us and so we can take a ride back without any hustles because can’t afford an hour delay. The taxi driver agreed for an additional 50 pesos on top of our metered bill. So for those who has a tight Itinerary you can do the same unless you have a better route to go and please feel free to share. Oh wow that is so interesting! How cool! @glen - bingo that really looks like a real one huh? I also thought the same at first! but pinoys are very creative - it was made by a coconut shell delicately crafted to imitate the turtles back :) may be because it would be to harsh to kill one for a guitar. Ouch, my eyes have failed me again. But those are sweet, superbly crafted by Cebuanos. Ang galing naman. Nagpapa-tour sila sa factory? Ang astig naman. Matutuwa nito ang sister ko. Hahaha. Pero diba mas cheaper ang price ng guitars sa Cebu kaysa sa Manila? @glen :) haha nanakakadaya talga yung guitar na yan. salamat biboy :) naks naman flattered ako na maappreciate ng isang photo blogger. hehe uu sakto nga tong store na to sayang nga ala kaming extra pambili nung nag cebu kami. I am in love with this guitars and how they are made! I'm from this place kaya pasencia na ha kokorek ako hehehe - it's Mactan Island, the city is Lapu - Lapu City (not Mactan City) hehehe. And very true halos walang taxing dumadaan dun, inner roads kasi, and if you're going for multicab, you'll wait a bit talaga. You mentioned this is your only destination in Mactan, di kayo dumaan ng Mactan Shrine? Hi po, maraming salamat sa correction :) naapreciate ko po at nakgaglak ako at patunay lang na me nag babasa nito. Allow me to correct po yung content para sa kapakanan ng ibang makakabasa.